The Greenlee Communications Sidekick® Plus helps technicians diagnose and troubleshoot problems with twisted pair cable. Using the latest digital technology the Sidekick® Plus provides an easy-to-use, feature rich, multifunction test set for today’s telecom engineer. 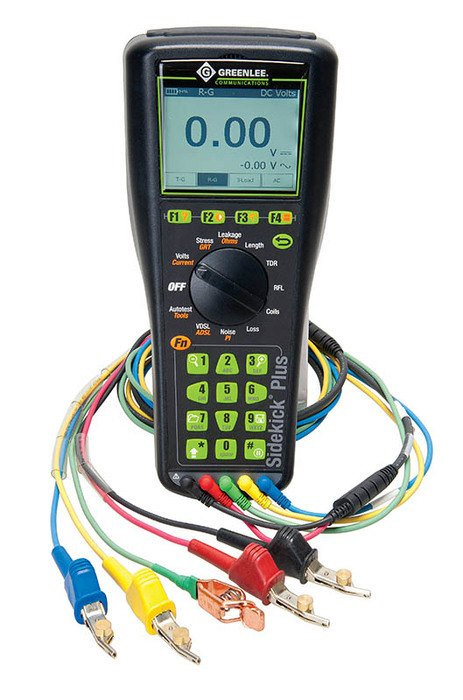 In addition to the standard Sidekick® Plus features - Stress Test, Volt-ohm meter (VOM), Loop Current tests, Longitudinal Balance, Transmission and Noise tests, Open Meter, Load Coil detection, Resistive Fault Locate (RFL) and a Time Domain Reflectometer (TDR) - we’ve added a 1 Gigaohm Insulation Resistance test, an optional suite of Wideband Spectrum Analysis tests, and an option for VDSL/ ADSL sync and service tests. With improved test set up and speed of test, and with a longer battery life, the Greenlee Communications Sidekick® Plus helps technicians get the job done faster, safer, and easier.